For those of you who were sad to put away your ThreadABead Christmas village, how about a larger building specially designed for the Easter season! This Easter cottage it just full of detail. The front of the cottage has an English flower garden, move around the corner to see a chicken with its chicks foraging under a hanging basket. Around the back is little Rosie Bunnytail picking a carrot from her vegetable plot while little Simon watches her from the window. Finally discover Alfred Bunnytail in his very smart dungarees picking up the Easter eggs from under the magical Easter bird. The cottage sits on a base which gives an additional 3D effect by showing paths and the garden around the cottage. Not only that, lift the cottage up to discover a secret Eater message underneath! The 3D house has been designed to sit on a mantle piece as part of a Eater scene. Made using Round Peyote and Odd Count Peyote the house takes around 16 hours to bead. As usual with ThreadABead featured patterns we give full detailed photographic instructions and in this pattern there are 76 detailed steps, making this pattern even suitable for beginners to beading. Please note the pattern may not work with any other size and type of beads. There are 14 colours in total and the finished beadwork is approximately 7.25cm (w) x 4.75 (d) x 5 (h) cm Wadding is optional and a no tangle thread bobbin is useful. 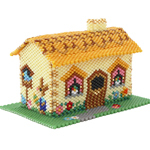 The bead pattern supplied is 27 pages and includes a full colour photo instructions and coloured pattern chart where needed.